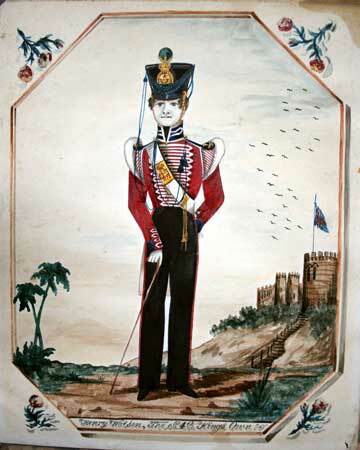 Private Soldiers of the 1830s. A portrait of Private Henry Watts painted in March or April 1831 before he sailed for Australia with the King's Own. The inscription reads: "Henry Watts, 4th King's Own, Lions of England, Dear Parents when you see this remember me And bear me in your mind When i am far in a Foreign Clime." On the reverse of the picture is written "Painted by Charles Dean late 15th Regiment... for H Watts ... Chatham, Kent"
Accession Number: KO1324/01 Purchased with grant support from the Army Museums Ogilby Trust. A portrait of Private Henry Watson, 4th King's Own. Likely to have been painted in the 1830s and possibly by the same artist, Charles Dean, of the portrait above of Watts. Accession Number KO2714/01 Purchased with support of the Museum's Acquisition Fund, Lancaster Military Heritage Group, the Duke of Lancaster's Regiment and the War Memorial Village, Lancaster. This style of painting/portrait is well known, although not common. 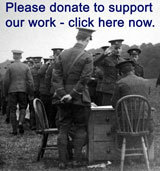 The next image is not a regimental soldier, but is included for interest. 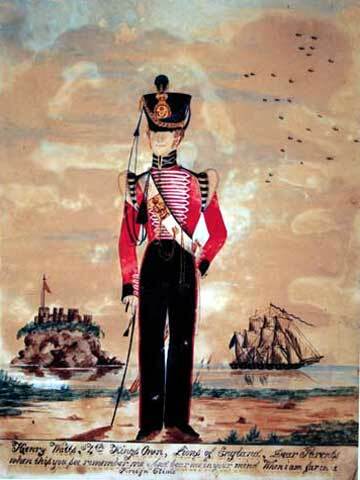 Private Woodburn of the 7th Regiment of Foot (The Royal London Regiment, later Royal Fusiliers) is pictured at Gibraltar in around 1842. 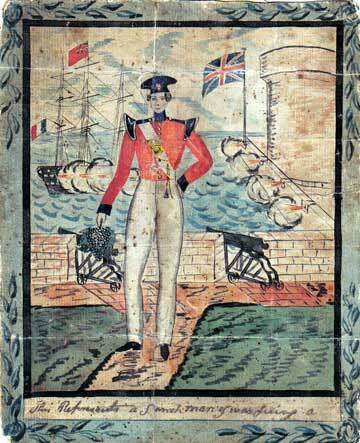 The image, received at the museum as a historical enquiry included a letter dated 18th September 1842 which identified the soldier.